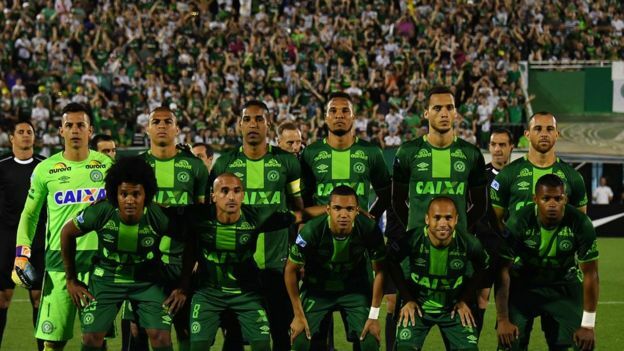 The chartered aircraft was carrying members of the Chapecoense football team. The first leg of the final of the cup, South America's second most important club competition, was scheduled for Wednesday, but has now been suspended. Later the team's vice-president, Ivan Tozzo, told cable channal SportTV: "There are a lot of people crying in our city, we could never imagine this. Chapecoense is the biggest reason for joy here." Reports suggest that at least two other footballers - goalkeepers Jackson Follman and Danilo - may have survived, as well as physiotherapist Rafael Gobbato. The British Aerospace 146 short-haul plane, operated by Bolivian charter airline Lamia and carrying 72 passengers and nine crew, crashed in Cerro Gordo in the municipality of La Union shortly before midnight local time (05:00 GMT). According to a Colombian airport press release, it had reported an electrical fault to the control tower. Poor weather meant that the crash site, in a mountainous area, was only accessible by land, and later Medellin airport tweeted (in Spanish) that the rescue operation had been suspended. There was no fire on impact, which appears to have increased the chances of survivors being found.